Toronto (ON), Canada – Zevrix Solutions today announces PDF Checkpoint 1.8.8, a compatibility update to company’s PDF preflight and conversion automation tool. Remarkably fast, PDF Checkpoint automatically preflights, exports as images, splits and optimizes multiple Adobe PDF files. PDF Checkpoint is an ideal solution for users who need a fast, affordable and easy to use app to check PDF files for errors and convert them to the desired format and color space. The new version adds support for the recently released macOS 10.14 Mojave and is offered as a free update to licensed users. The update also features implementation of the SoftwareKey licensing system, which offers users streamlined registration experience with the ability to manage their activations in a personal online license portal. 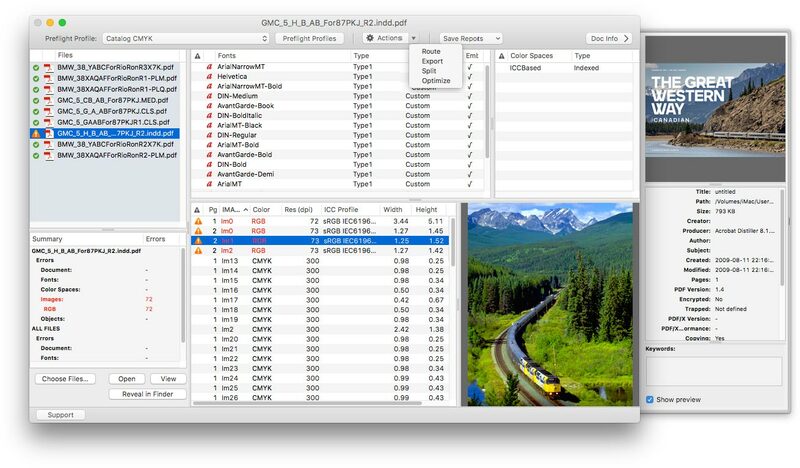 For example, users can preflight a folder of PDF files and convert them to TIFF images at 300 dpi while scaling each page by 50%. Users can also create print-ready PDFs from such apps as Apple Pages and Swift Publisher by converting colors to the recommended CMYK profile. PDF Checkpoint can be purchased on Mac App Store and Zevrix website for $39.95 (USD), as well as from authorized resellers. The update is free to licensed users. Trial is also available for download. PDF Checkpoint requires macOS 10.7-10.14.